UMP | University of Minnesota Press Blog: Wendell Anderson and the Minnesota Miracle: A look back. Wendell Anderson and the Minnesota Miracle: A look back. Wendell Anderson and joined by Rep. Martin Sabo and Sen. Stanley Holmquist. Anderson died in July 2016 at the age of 83. On November 8, 2016, a political wave arose from a sea of resentment and urge for change and swept across the country. Whether the wave will roll on for awhile as happened after the 1980 election of Ronald Reagan, or will disintegrate after crashing into electoral rocks in just a few years, is anybody's guess. A look at some state history provides thoughts and ideas for coping with the current political turmoil in both major political parties. The 1960s and '70s were also a time of bitter resentment and at times violent turmoil in America, with rallies and bombings against the Vietnam War, civil rights battles, rancorous abortion arguments, protests against high taxes, and demonstrations over environmental degradation in the forefront of political action. This was the backdrop in Minnesota in November 1970, when a statewide election signaled a wave of change forming in state politics and government. The 1970 election led to major changes in public policy that quickly sent fiscal and political shock waves throughout the state. Democrat Wendell Anderson was elected governor of Minnesota in 1970, and fellow Democrats came close to breaking the long-standing Republican control over the Minnesota Legislature. I had the privilege of being a part of this as I was elected to a first term to the legislature in that election. One of the first things I observed was Governor Anderson's (or "Wendy," as he was commonly called) remarkable relationship-building and negotiating skills. Wendy brought people into government who combined long-term strategic policy and short-term tactical politics in a most impressive manner. Wendy gave his staff flexibility to suggest, create, and develop policies. Once he made a decision, he commonly turned the matter over to others for implementation. This approach also provided the legislature with some latitude to make changes. He was not afraid of compromise. In his first legislative session as governor, Anderson needed bipartisan legislative support to bring about the major policy changes on which he had campaigned, and he claimed a mandate to "fix the fiscal mess" he had inherited. This 1971 legislative session involved a sharply divided government, with the Republicans barely retaining control over both the House and Senate. Anderson's relationship-building skills and flexibility paid off when Anderson, with strong help from then-House Minority Leader Martin Sabo (D) and Senate Minority Leader Nick Coleman (D), crafted complex fiscal legislation that gained the support of Senate Majority Leader Stanley Holmquist (R). This critical bipartisan leadership led to additional support from several of Holmquist's Republican colleagues. After a bitter political and protracted fight that lasted through the longest special legislative session in the state's history, the major fiscal overhaul passed with bipartisan support. The interaction between the state and local units of government in this legislation illustrate an important aspect of the flexibility built into our federal system. In what became known as the "Minnesota Miracle," (most thought it a miracle that it passed), the state's fiscal policy was overhauled in a manner that changed the state for decades. State government suddenly assumed the burden of funding the lion's share of education and local government costs. State revenues, primarily from the income and sales taxes, were raised by a whopping 23%, and local property taxes were substantially reduced. The higher state funding was then redistributed through complicated but fair formulas to school districts and other local units of government. Such revenue sharing and other legislation which passed proved popular, and in 1972 the wave of change grew larger with Democrats winning control of both houses of the legislature. This was the first time since statehood that the Democrats controlled both the legislature and the governorship. 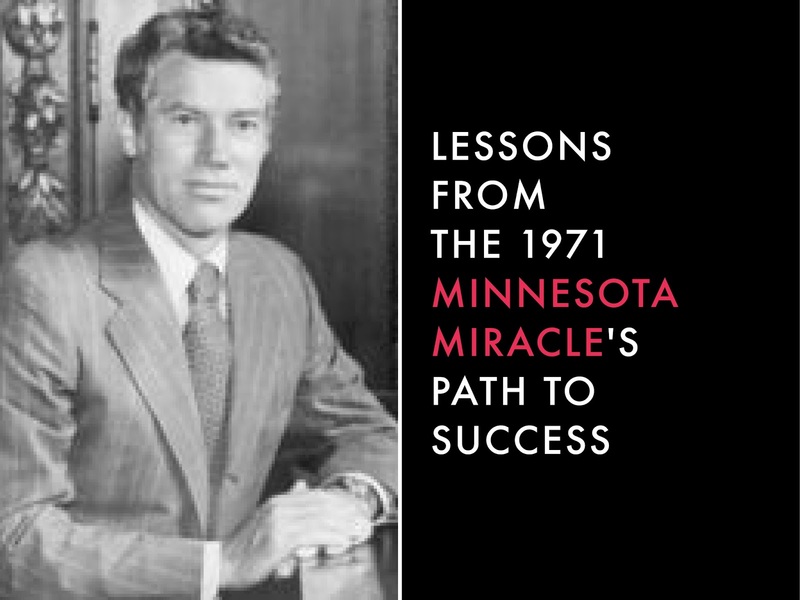 One lesson illustrated by the passage and workings of the Minnesota Miracle is the flexibility built into our federal system. It is helpful to think of this system as having three dimensions (federal, state, and local), each of which has constitutional, statutory, and historical restrictions on what it can and should do. Too often well-meaning change runs into constitutional or other legal impediments that could have been avoided with more forethought. Whether pursuant to constitutional mandate, federal or state laws, or longstanding policies, some actions are best taken at the federal or first dimension level, some at the state or second dimension level, and many at the all-important third dimension or local level. This critical third dimension is where most federal and state policies are implemented. Mechanisms such as zoning codes, location of sewer and transit lines, administration of schools, welfare and health programs, and the conduct of police and sheriffs’ personnel are vital to a successful policy and are local in nature. The thoughtful use of the second dimension in raising state revenues coupled with using the third dimension in the distribution of the new funds to school and municipalities was carefully thought out in drafting the Minnesota Miracle. This proved critical to both the successful passage and implementation of the legislation. The second and third dimensions have also proved important for both progressives and conservatives during the recent years of gridlock in Washington. Several states and local governments have carefully used their power to bypass Washington and implement programs raising the minimum wage, providing paid sick leave for employees, allowing use of marijuana, establishing gun safety programs, and adopting critical environmental safeguards. Unfortunately, other states and localities have used their powers to try and restrict voting and cut school funding. While this dimensional complexity is the inevitable consequence of our federal system, it also provides an avenue for change. The 2016 election provides ample opportunities for thoughts on how this should and will play out in coming years. Wendell Anderson understood the three dimensions of government. He invested heavily in relationship building in the 1970s and showed willingness to compromise. This knowledge and conduct paid off handsomely for the people of Minnesota for over a decade, as the policy improvements adopted during the 1970s lived on. Yes, it was a different time. But the Minnesota Miracle showed it can be done, even in unsettled times. Tom Berg is a Minneapolis attorney who was a member of the Minnesota state legislature from 1971 through 1978. He later served as the U.S. Attorney for the District of Minnesota. 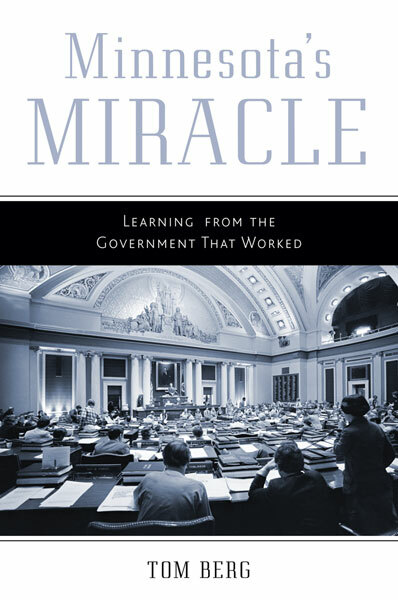 He is author of Minnesota's Miracle: Learning from the Government That Worked. "I have spent a life in canoes."